We do take and use screenshots for various purposes and use different tools for the same purpose. While you can use browser add-on’s for taking screenshots, they have one limitation, if you want to take screenshot of other applications it becomes difficult. Greenshot is a free application for Windows that makes it easy to take screenshots of any application. 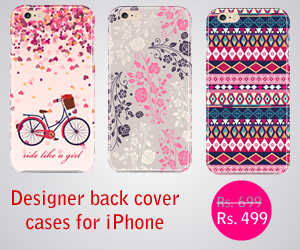 It is a tiny application and comes with cool features like inbuilt image editor. The Image editor included is not full blown app, but it is enough to annotate the screenshot before sharing it with others. Greenshot sits in the system tray after installing. Whenever you want to take a screenshot, just hit “print screen” key on the keypad or right click and select, immediately it is activated, and you can see the green lines on your screen. You just have to drag the portion of the screen you want to take as screenshot, it will do that and opens it in image editor. In the Greenshot image editor you can annotate the screenshot by adding text, shapes etc. If you want to blur part of the image you can do that with the tool’s Obfuscate function. 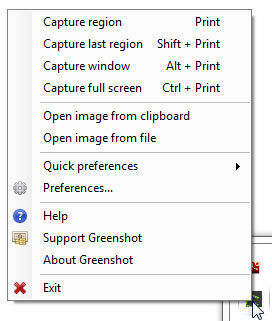 In the preferences window in Greenshot image editor or right-click menu you can select options like Jpeg quality when saving images, what should the application do after taking screenshot, open with image editor or save using default settings, or show save as dialogue. It also supports hot keys, using shortcuts you can take screenshots of a regios, window or full-screen. Greenshot is a nifty application quite useful for taking screenshots, the good thing about the application is it sits in the system tray, and you can invoke with a key stroke, and taking screenshot is a snap. 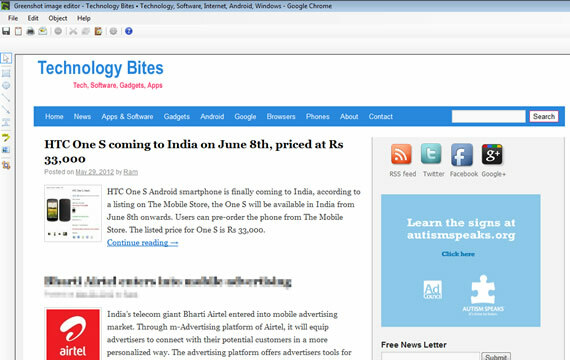 If you are looking for browser extensions that do the job, check put Fireshot and Screengrab for Firefox.